Maria Jarema was a sculptor, painter, and stage designer. She was born in 1908 in Stary Sambor, and died in Kraków in 1958. Sculptor, painter, and stage designer. She was one of the most interesting artistic personalities to work with Tadeusz Kantor after 1945. She collaborated with Cricot 2 (not just as a stage and costume designer, but also as an actress). Although she was heavily involved with artistic groups, she maintained her own unique style. She studied and started working before the war. She got her first box of paints from Zygmunt Waliszewski, but chose sculpture as her degree. She studied at the Academy of Fine Arts in Kraków, where, in the years 1929-35, she studied sculpture with Xawery Dunikowski. Before the war she was a sculptor first and foremost. She created tight forms, referring to the organic world; forms whose liveliness and elasticity were underlined by their smooth surface. 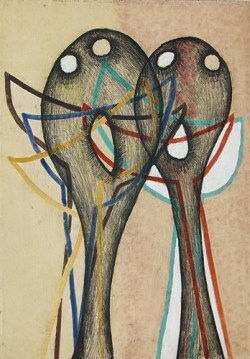 Later she sporadically returned to the sculptor's workshop, consistently using forms created before (Kompozycja / Composition, 1956). Before 1939 she was a member of the left-wing Kraków Group, along with Leopold Lewicki, Stanisław Osostowicz, and Jonasz Stern, among others. After 1945 she joined Grupa Młodych Plastyków (Young Artists Group). She was one of the initiators of the reactivation of the Kraków Group, which was possible due to the “thawing” atmosphere of 1957. Together with her friends she took part – as a painter – in all three Modern Art Exhibitions (Kraków 1948-49, Warsaw 1957 and 1959). Apart from painting, she worked as a stage designer (mostly for Kantor). 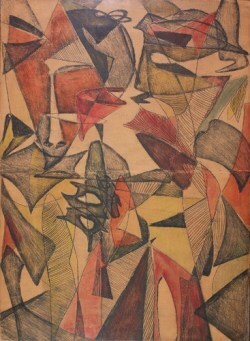 She had interesting experience in that field, because before 1939 she collaborated with the experimental Cricot theatre, created by her brother, the painter Józef Jarema, who was an effective organiser of artistic life, collaborated, among others, with the kapists, and who, after 1945, remained abroad. It’s for Cricot that she started designing daring costumes and stage projects, which prepared her for her work with Kantor's post-war Cricot 2. While realising her theatrical passions, she didn’t forget about her original artistic work. After 1945 she tried painting, starting with modest gouaches, distempers and watercolours. She was fascinated by textures that she connected with grotesque motifs. Such works as Koniki / Horses, Tancerki / Dancers, Rycerze / Knights were proof of her interest in fantasy and allusion. With time the world of imagination lost its importance and in a few compositions from the late 1940s she tried to show visible reality (Ptaki / Birds, Rybak / Fisherman). Her greatest works were created during the few years before her untimely death. Since in 1951 she created her first monotype, her works situated themselves outside of any conventions and demands. She was fascinated with the human shape and its place in space and also with showing movement in paint. This can be seen in her cycles: Postacie, Figury, Głowy, Chwyty / Characters, Figures, Heads, Grasps (1953), Wyrazy / Words (1954-1957) and Filtry, Penetracje, Rytmy / Filters, Penetrations, Rhythms (1957-`1958). These works were created with her favourite monotype technique, which she connected with oil, distemper, and sometimes varnish. Thanks to this diversity of techniques, her early compositions seem very fresh. Later ones can sometimes feel monotonous, but they still give the impression of lightness and transparence. Balancing between figurative displays and almost abstract signs is also characteristic of the artist. Works that belong to the series mentioned above, show a gradual, yet consistent deformation (simplifying and flattening) of the human form. This process leads to the fragmentation of the figure into small parts, almost abstract atoms of a whole that is hard to recognise. They often seem identical, they penetrate and diffuse like shadows, creating disturbing frictions and rhythmical movement. Consequently the surfaces of the composition seem to change, flicker, as if coming from a mysterious reality that cannot be directly accessed by the spectator. The artist’s body of work remains an original metaphor of her personal experience. This metaphor is quite hermetic, but Jarema treated art as a field of deeply individualistic action, and even when Kantor postulated creating art that would be communicative, she renounced any utilitarianism and remained faithful to her poetics. 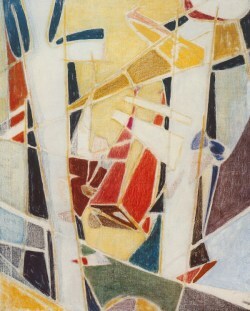 Her works represented Poland at the Venice Biennale (1958) and – after the artist’s death – at the Modern Art Biennale in São Paulo (1961). Critics were very interested in her works. A detailed bibliography can be found in a book by Barbara Ilkosz which accompanied Jaremianka’s (as her friends called her) exposition organised in 1998-99 in Zachęta in Warsaw and in the National Museum in Wrocław. Author: Małgorzata Kitowska-Łysiak, Art History Department, Catholic University of Lublin, January 2002, translated by N. Mętrak-Ruda, October 2015.